Martin Scorsese’s films, for better or worse, have all been about movement. Whether realized through his swift camera movement or through the interaction of his characters and their social circles, his films have a compulsive need to propel. Growing up in a working class Italian family, cultural and socioeconomical forces have composed this propulsive movement through his films: whether it be the rags to riches narrative found in a film like Goodfellas, the brotherly camaraderie of Mean Streets, or the isolated poverty of Taxi Driver and The King of Comedy, there’s a sequined pattern of concerns on mobility. The Wolf of Wall Street is much like his other films: it placates itself on concerns of upward mobility. But unlike his other films, which were in large part expressions of street living, The Wolf of Wall Street is far more concerned with the aftermath of upward mobility. Scorsese essentially forsakes the low-level thugs of Mean Streets, dispenses with the useless nostalgia of gangster life in Goodfellas, and completely shits on the perceived nobility of workaday living in Bringing Out the Dead - real happiness is found when you have a lot of money and a lot of money can only be had on Wall Street. Loneliness and the cinema. When looking at some of the best films about or dealing with the filmmaking process, whether it’s Sunset Blvd., In a Lonely Place, Peeping Tom, or even Boogie Nights, there seems to be an overarching sense that the people involved in film are afflicted with a great sense of loneliness. Even the passive viewer can find themselves drawn to the appeal of cinema, whereupon inhibitions are lowered and one can embrace the screen. Amid the many layers that make up Hugo, at its core, one can find Martin Scorsese’s passionate embrace for filmmaking and the manner in which audiences are drawn to the cinema. Hugo’s sweeping opening shot exemplifies the kind of command that Scorsese has over his tools. In his first foray in 3-D filmmaking, Scorsese thrusts you into a beautiful Paris scenery. 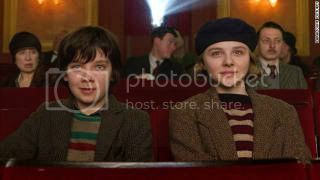 Scorsese swiftly moves into a train terminal as a young boy named Hugo (Asa Butterfield) attentively watches the goings-on of the station. An orphan, Hugo diligently attends to the station’s clocks, oiling gears and tuning the time. The larger framework operating here is the sense of limited time at hand for both for Hugo and a toy shop owner in the station by the name of Georges Méliès (Ben Kingsley). Hugo views the world through a lens of nostalgia, whereupon he looks fondly at times with his father. Hugo’s ambitions are driven by that time, as he hopes to successfully repair an automaton that he and his father had worked on. For Méliès, time has not been kind to the man, as his career as a pioneering filmmaker has left him dwindling in obscurity. He’s an interesting opposing force to Hugo, in that the two look at time through very different angles. But it’s their admiration for cinema that is ultimately what ties the two together. When Hugo reminisces, he thinks back to the time he and his father went to the cinema. 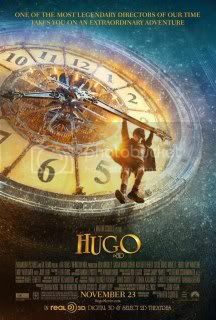 As he bonds with Méliès’ goddaughter Isabelle (Chloe Grace Moretz), Hugo takes her to a showing of Safety Last!. Even there, the film’s consistent sense of time ticking away can be illustrated by Harold Lloyd gripping onto the minute hand of a clock. Méliès’ story is Hugo’s most profound and tensely emotional aspect. It serves to encompass a feeling of cinematic adoration, whereupon both the audience and Scorsese can examine how films have shaped our worldview. I’ve often been critical of Scorsese’s efforts, particularly over the past decade, but what he achieves in Hugo is truly remarkable. He marries his own sharp instinct with that of a new technology and serves a story about one of cinema’s earliest pioneers that is underlined by a true sense of poignancy and conviction. And when it comes down to it, it serves to speak to Scorsese’s passions as a filmmaker. It also happens to be his best film since his 1999 effort, Bringing Out the Dead.